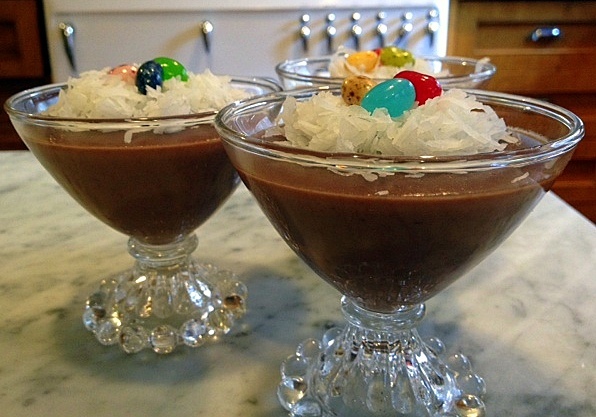 Here's a five-minute Easter dessert sure to please children and adults. This old-fashioned chocolate pudding can literally be put together in minutes with everyday ingredients -- milk, chocolate, sugar, salt, butter, cornstarch and salt. This is a godsend for those pressed for time, like me. At our house, we're celebrating both Passover and Easter tomorrow (the DD calls it Peaster), so between the brisket, the chicken soup and ham, I was looking for a really easy dessert. 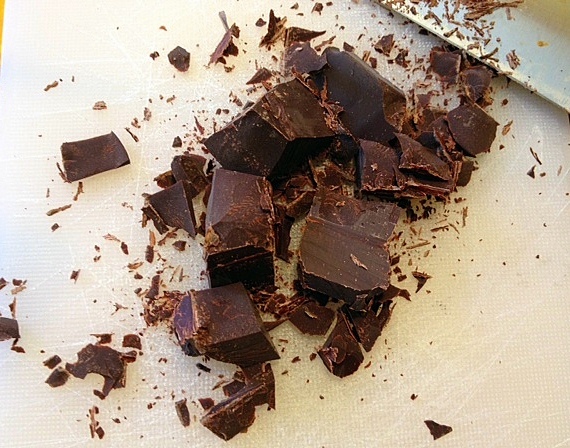 Chop one square (one ounce) of unsweetened chocolate. 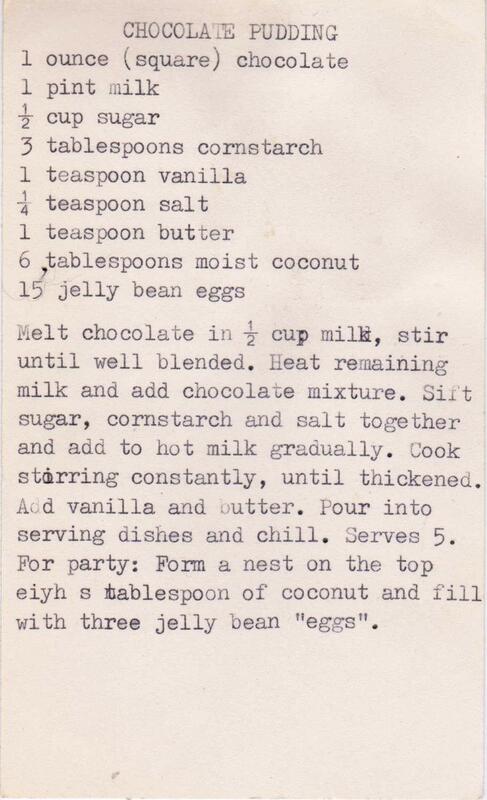 Melt it in 1/2 cup of milk. 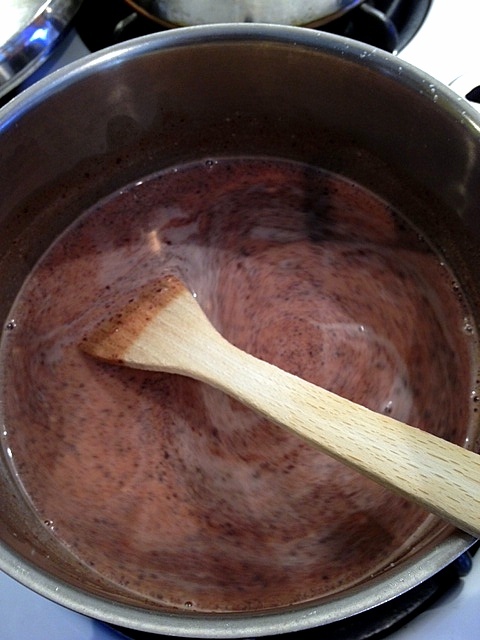 Heat the remaining milk in a two-quart saucepan and add the melted chocolate mixture. Next, add the dry ingredients (which you've sifted together). Cook until thick -- it took less than five minutes. Pour into small custard cups. The recipe says five, but I filled just four. I guess in the 1940s, when this recipe card was written, portion sizes (and the average American weight) were much smaller (and lower) than they are today. Refrigerate until cold. Now, the fun begins. Form nests using sweetened coconut (like Baker's) and fill each with three jelly beans. I used the Jelly Belly brand, but any will do. This recipe card is from one of the very first boxes I purchased in Akron. I always avoided this recipe, since it was thickened only with cornstarch and lacked eggs, which add richness. If you want to really guild the lily, you can use this richer pudding recipe, though this simpler one is quite nice, and easier on the waistline. 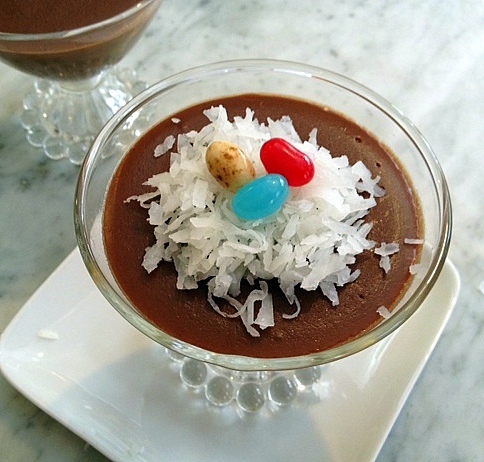 Homemade chocolate pudding (whether it takes 5 minutes or 55 minutes) is love in a bowl. I like the idea of a quick recipe that can be made at the last minute. Happy "Peaster" to you and yours! Thanks, Dawn. The pudding was a big hit! There is nothing that can compete with homemade chocolate pudding - except for maybe homemade butterscotch pudding. 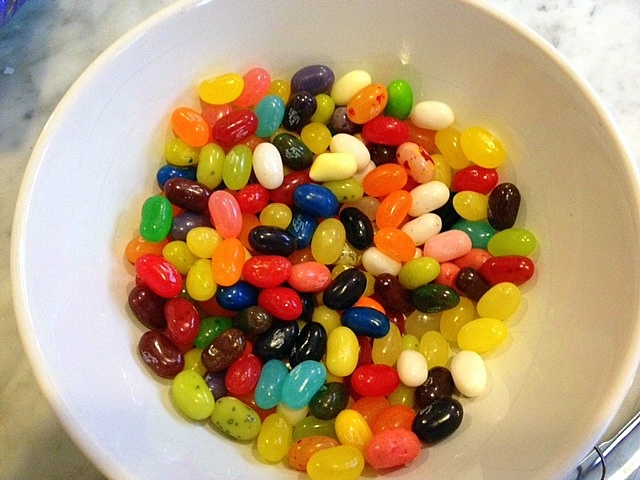 Love the recipe that included the jelly beans! So true, Abbe. I once made butterscotch pudding (with real scotch, and from a modern recipe, i.e., no cornstarch). It was complicated and nerve-racking, but oh, so worth it. is some people are accustomed to butterscotch imposters.I am glad to have grown up with the real deal, homemade crust too! Thanks Mom! 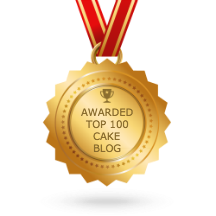 Thanks for writing, Penny and kudos for making those recipes. Sometimes, when there are no instructions, I may search for similar recipes on the internet for technique tips. Cakes are easier; puddings are a bit more challenging. And lucky you, growing up with a Mom who made things from scratch! As for speaking out loud, yes. Sometimes to express gratitude, other times to curse!! My SIL once suggested that perhaps some of the recipe boxes I buy were relinquished by family members because "mom was a terrible cook, we don't want these recipes!"